Cattle grazing on Brachiaria grass at the ILRI campus in Nairobi Kenya (photo credit: ILRI/Collins Mutai). 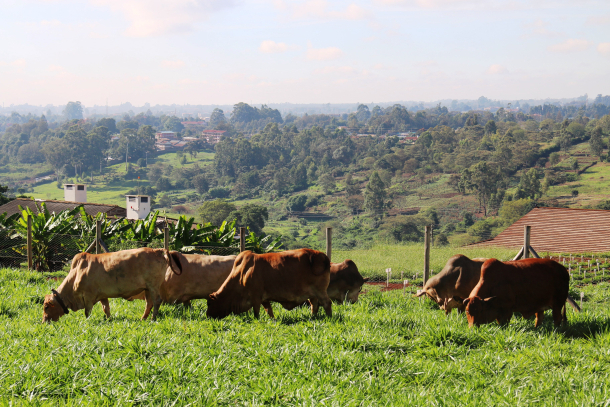 ‘A team of researchers at International Livestock Research Institute (ILRI) are testing Napier, Rhodes and Brachiaria grasses for cattle feed, and then physically measuring the emissions in a respiration chamber within the institute’s laboratory. ‘”The study will help African countries monitor, measure, verify and report their emissions with the aim of reducing their nationally determined contributions [NDCs],” said ILRI principal scientist Klaus Butterbach-Bahl. . . .
‘”The measurements will help find better locally available tropical feed for the region as opposed to overreliance on feeds from the temperate world,” he said. 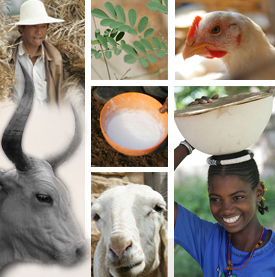 The ILRI study, which started three weeks ago, is the first of its kind on the continent. It involves 18 cows of Boran breed, and will go on for the next five months. Tags: greenhouse gas emissions. Bookmark the permalink.